The Clayoquot Sound UNESCO Biosphere Reserve, typifies the majesty of the Pacific Northwest, boasting flawless natural beauty, accentuated by a tapestry of vibrant communities and stunning backdrops, and contains some of the most sought after wildlife by photographers around the globe. We have lived in this area and have run a number of workshops in British Columbia. We have relationships with the lodge owners and staff and have scouted this trip extensively to know where the best spots are to photograph. Our company has ran over 100 workshops in the last fiv years and have experienced guides and photographers to help you with logistics and teaching. Included: All accommodation in hotels or private two or three bedroom cabins(*) for the clients, two ferry rides to and from the island, all meals except that which is not covered in itinerary will be home cooked at our cabins or restaurants in Campbell River, stocked fridges for any snacks, all National Park entrance fees, all Provincial Park entry fees, all wildlife viewing fees, all transportation from pick up to drop off. Not Included: Items of personal nature, alcohol, laundry, travelers insurance, international travel, entrance VISA, extra nights if needed. Arrivals and departures for all workshops that should be communicated to your attendees: Please be in Vancouver, British Columbia to be picked up at 10am on day one of the workshops. Plan your departure on the last day after 5pm as we will be dropping you off near, or at the Vancouver airport between 3pm and 4pm. Flights should be scheduled into Vancouver International Airport. If flying in the day before the attendees should stay near the airport at one of the local hotels. A list and contact numbers can be provided. Your group will be picked up at the Vancouver International airport or their hotel in Richmond near the airport. Pickup is at 10:30am. From there we will take the two hour ferry ride across the Georgia Strait, ending up in Nanaimo on Vancouver Island. From Nanaimo we head west towards the west coast of Canada to your cabins near tofino. Today’s transportation time will be a 2 hour ferry ride where you will be able to take photos on upper deck or sit in comfortable seats inside. Diving time from Nanaimo to Ucluelet is 182km and will take is 2 hours and 40 minutes. We can take one or two stops along the way to give people a break and the opportunity to take photos in you wish. We will be located in Ucluelet at terrace beach right at the start of the Wild Pacific Trail and Amphitrite point lighthouse just south of the pacific rim national park, world famous long beach, Clayoquot sound and Tofino; and just north of the Broken Group Islands and Barkley sound. Today we will be taking two tours in search of Black Bear and Whales. 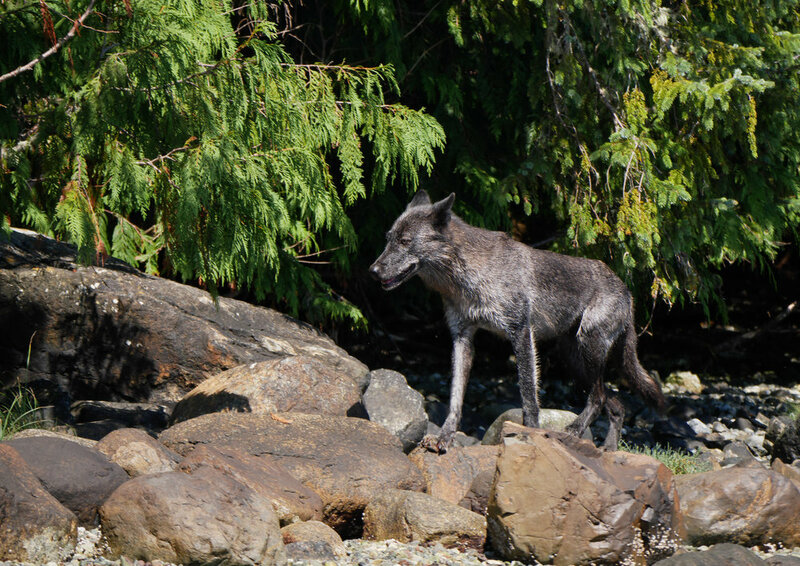 Black bear tour- Is a 2 hour tour at low tide in the Clayoquot Sound. 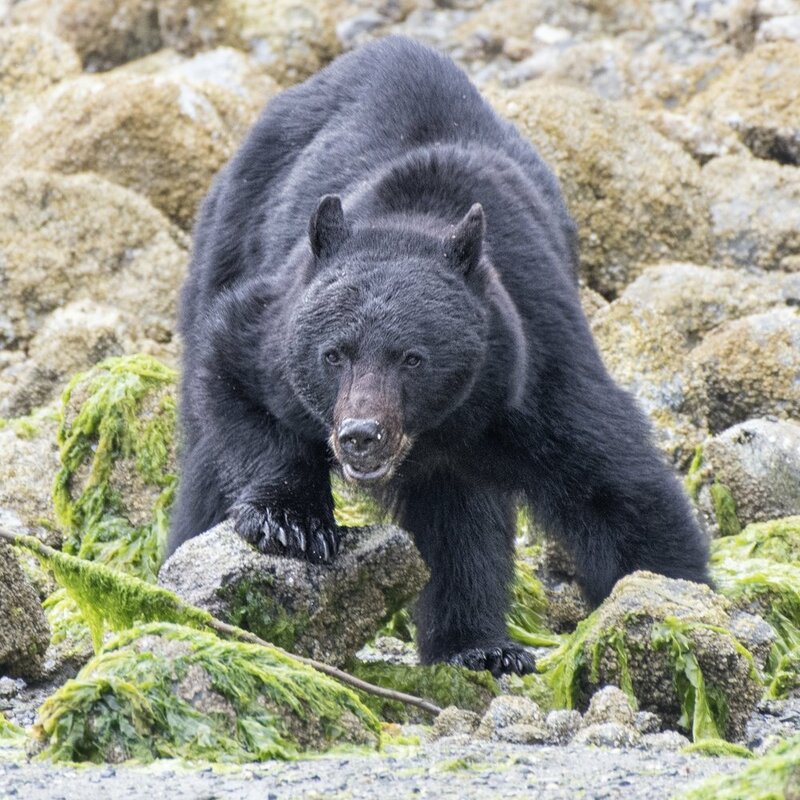 This area offers the most incredible coastline for viewing black bears. These tours cruise through the protected and calm waters surrounding scenic Meares Island. These resident bears come down to the beaches at low tide to forage for such beach delicacies as rock crab, starfish and even a bit of kelp. They are an absolute pleasure to watch from the boat and thanks to their poor eyesight they are usually unaware of our presence so long as we keep quiet and a respectable distance up wind. You will also have opportunities on this tour to view an eagle aerie, harbour porpoises, seals, river otters, blue herons and other species of wildlife! Whales- This 2.5-3 hour tour is our chance to seek out grey and humpback whales. They dive, spout, breach, spyhop and lobtail! These are all typical whale maneuvers you may expect to see off British Columbia’s west coast. Because much of this coast is uninhabited and accessible only by boat or floatplane……it remains a pristine wilderness. This rich and nutrient filled ocean is loaded with a variety of marine wildlife including many different species of whales as well as harbour seals and sea lions, sea otters, porpoises and a myriad of birdlife including puffins, blue herons and bald eagles. Thanks to mother nature, her ever changing cycles always prove to be unique. Clayoquot Sound is very popular with gangs of marauding transient killer whales on the hunt! 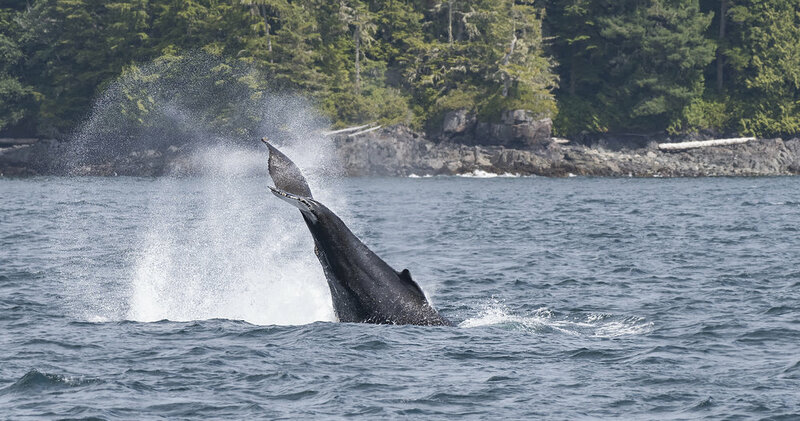 Annually we enjoy record numbers of humpback whales and our summer resident grays. For those that wish, we can head out to one of the many secluded beaches along the island and photograph the sun setting along the wild shoreline of wind swept trees and crashing waves. It’s an early breakfast and on the road early for our drive from Tofino to Campbell river This 3hrs 25min, 270km will be broken up with a few stops along the way. The one stop we will make is at Cathedral Grove. Cathedral Grove, located in MacMillan Provincial Park, is one of the most accessible stands of giant Douglas fir trees on Vancouver Island. Here, the group can stroll through a network of trails under the shadow of towering ancient Douglas-fir trees, majestic pillars untouched by the modern world – some more than 800 years old. Upon our arrival in Campbell River we will check into our hotel and prepare for another tour for more whales. 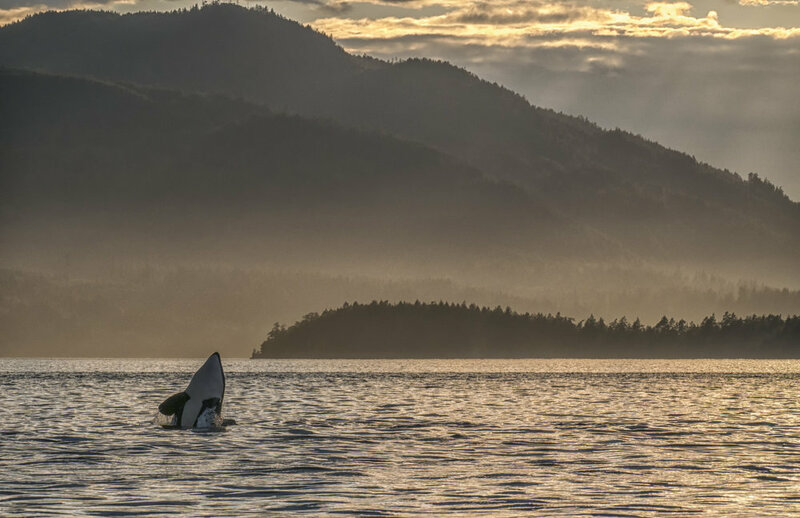 This outing is a time to photograph transient and resident pods of as many as 120 whales gather around Robson Bight and Telegraph Cove each summer, making Vancouver Island and Campbell River one of the world’s hot spots for watching. These incredible mammals arrive each year to socialize and mate, giving lucky on-lookers a rare chance to see them in the unspoiled splendour of their natural habitat. 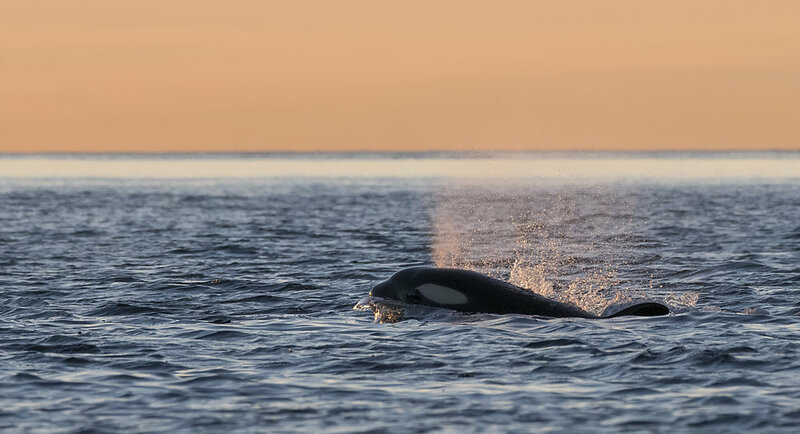 Whale watching is one of the world’s most thrilling travel experiences – a rare chance to observe Orca whales in a stunningly beautiful setting. Today we will be grabbing a nice breakfast before our day out on the water. Today will be an 8 hour tour thats hopefully action packed like the years before. Our targets for today will be a mix of anything that wonders across our lenses. Our primary targets will be black bear and grizzlies foraging along the shore lines. Seals and otters that forage along the rocks for small fish and other sea creatures. Knock on wood we have had many successful outings with breaching humpbacks in this area. Our timing of this workshop is geared around mate attraction season, this is the most active time to view humpbacks all year long. Lob tailing, breaches, net feeding and tail flukes are all possible. Do you have your camera ready? After our day out on the water we will enjoy a nice meal not far from the docking of our boat. Here we will eat like kings while we enjoy the view of Campbell river from our table. If you still have some juice left in you from our day out we can walk across the road from our lodging and enjoy photographing a nice sunset wrapping up our day. Today is your second day for Grizzly bears… We will be out all day photographing Grizzly Bear for seven to eight hours. Have you ever imagined standing metres from wild grizzly bears feeding on fresh, west coast salmon in one of the most pristine wilderness areas on earth. A bucket list item for many, grizzly bear watching is a rare and wonderful privilege in this part of the world. After our second day with the Grizzly Bear we will head south towards Cowichan Bay… because tomorrow is a full day tracking down transient and resident orca pods with our good friend, and long-time whale guide, Simon. This is a two hour drive south and our arrival will be early in the evening, in time for a leisurely dinner and a chance to go through all our images from the last two days. We are first on the water. Our first opportunity to photograph the orca pods in the soft morning light. 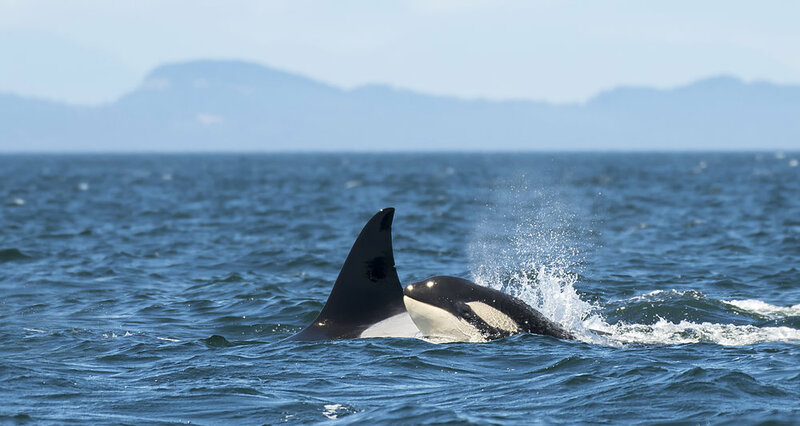 Our first four hour whale tour will focus on the Southern Resident Orca Whales, Transient Orca Whales, Humpback Whales, Grey Whales and Minke Whales. But that will not be the only wildlife you will see. Keep your eyes open for Sea Lions, Bald Eagles, Harbour Seals, Dalls and Harbour Porpoise as well as a myriad of marine birds on your whale watching eco tour. After our first tour you will have some time to wander the quaint town buy some souvenirs or relax on our patio before we head back out later that day for one more chance to get the shots. We are last on the water today. 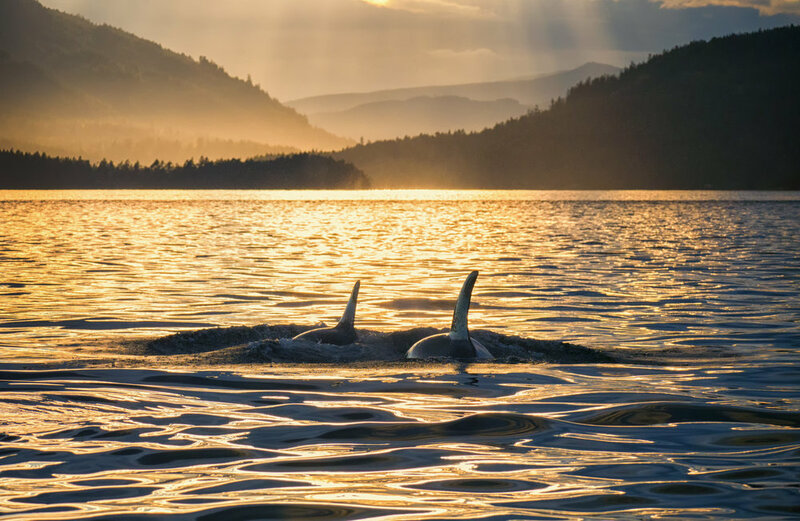 Your last opportunity to photograph the orca pods in the golden evening light. 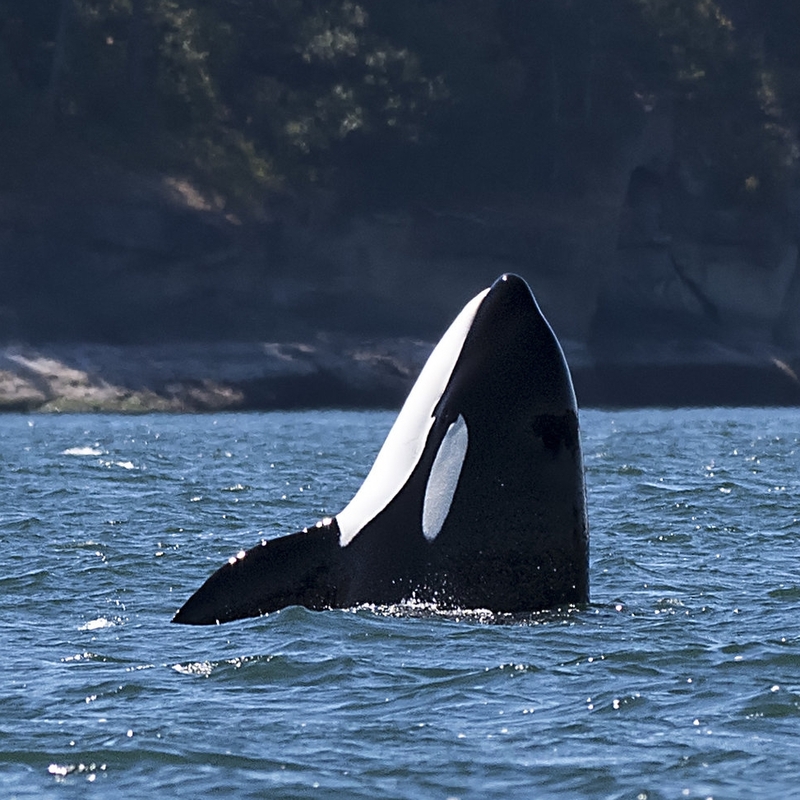 Our last four hour whale tour will once again focus on the Southern Resident Orca Whales, Transient Orca Whales, Humpback Whales, Grey Whales and Minke Whales. Today we wake and depart for the ferry terminal for a late morning sailing back to Vancouver. Today’s ferry ride is to Vancouver out of a different port in Victoria. You will be dropped off at the Vancouver airport between 3pm and 4pm. Ready to Photograph Bears and Whales in British Columbia, click the button below and we will see you in Vancouver!